The first of the fall apples have been hitting our store shelves this past week, and that always makes me happy. 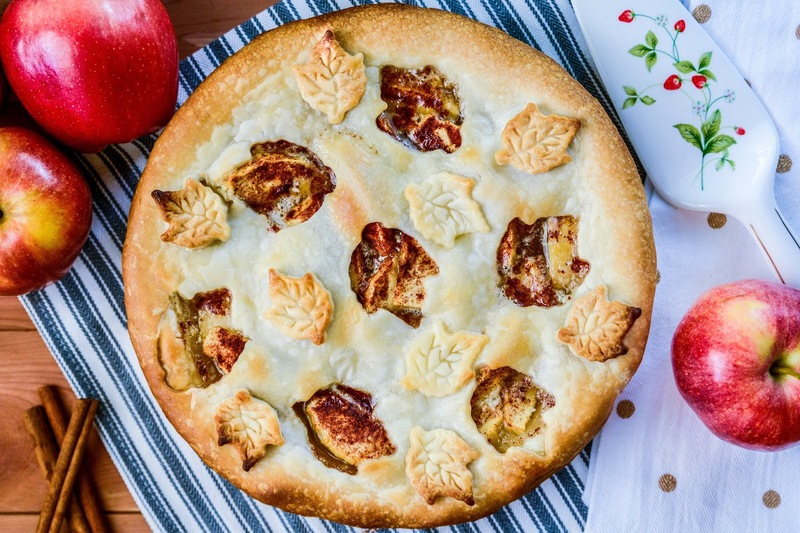 I simply love the flavors of fall, and apple is my favorite! I ended up buying a huge bag of them earlier this week without having a recipe in mind, I just knew the majority were going to get gobbled up as an afternoon snack, sliced and paired with a heaping spoonful of peanut butter. I'm old school and will always have a fondness for simple snacks I enjoyed in my childhood. 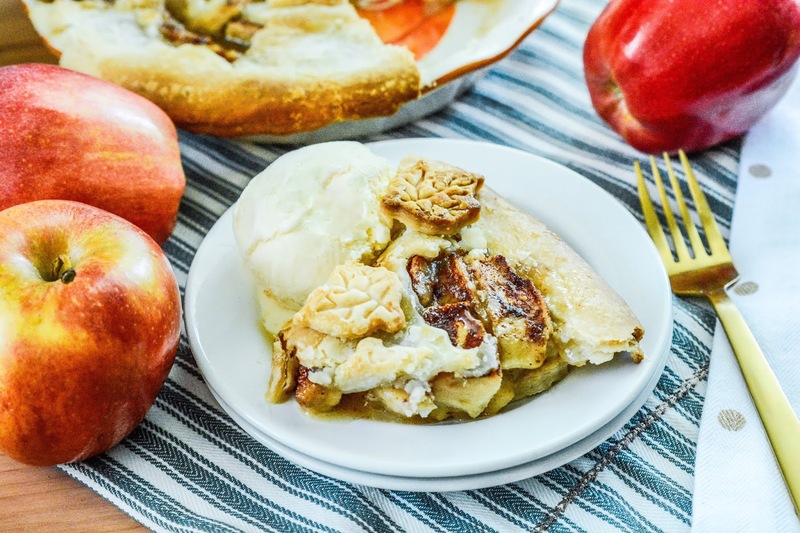 I did notice that I had about half a carton of ice cream just sitting around in my freezer, and I thought what better way to use it up than to pair it with a fresh baked apple pie? I ran over to Golden Blossom Honey to see if they had a suitable apple pie recipe, and sure enough I honed in on this Honey Apple Pie. Now, you could be greedy and hog this deliciousness all to yourself, and I certainly wouldn't blame you one bit if you were feeling a little stingy after baking this pie, but it is the season of fall carnivals and bake sales, so what better way to spread the fall flavored love than making a few pies for community fundraising? Best of all, this pie has minimal ingredients, so you can have it ready to pop in the oven in no time. Gala, Granny Smith, Fuji, Jonagold.... What's your favorite kind of apple? It turned out so lovely, dear! I bet the house smelled like apples and cinnamon! Love the golden forks! This year rose gold was all the craze, wish we had some cutlery in that lovely colour too! Jonagold and Golden Delicious are my faves, but I've been eating gala mostly this summer, they were largely available at my grocers this season. Gala are the first to hit our shelves and are in abundance right now. We should be getting loads of the other varieties any day now though. I always love seeing the produce section overflowing with fall apples. I love rose gold! I don't think I've seen any silverware or kitchen utensils in it though. If I do come across some, I'll be snapping a few up. It is such a pretty color! I've seen once Marchessa red gold cutlery at Bloomingdales :) Mepra also has some really fancy, modern, nice ones with simplistic lines. Jason read our convo here and I am now the proud owner of a rose gold utensil set. I'll tweet you a pic. You could sure make a killing, or raise a lot of causes if you were being nice haha, at a bake sale. Apples are a win any day. Thankfully, the girls no longer have bake sales since they are out of elementary and middle school, so I don't have to do those anymore. I used to be up to my elbows in cookies this time of year for all of the sales and carnivals. I'm so happy those days are over. I don't know if I have a favorite. I think I like all of them. Mica recently told me he likes pie over cake. For his birthday I just bought 4. 2 for his family birthday party, and 2 for his friend birthday party. I'm so horrible with crust. I need someone like you to give me a tutorial. I'm that bad. I'm with Mica. I don't really like cake and would much rather have pie. I love pie. The family gets me cheesecake for my birthday though since it's my favorite. That looks so good and I don't even lie pie most times. I'm not a fan of traditional crust. Alissa and her family are my favorite Apels. ;) If you're talking food (and I know you are), any kind of apple makes me happy but I think Gala Apples are my favorite. :) We just picked a big bag of those up yesterday and it made me wonder if the pumpkin patches are open (where we get our apples from the market). I think I'll check now while I'm thinking about it. This pie looks delicious, and I love that it has a cup of honey in it. I also love those leaf cutouts! Oh I'm so hungry right now (damn that diet) I bet I could eat two of those. So beautiful!"!! I love apples pies!!! hugs!